5 Invasive Trees That May be Hiding In Your Yard - Kauai Seascapes Nursery, Inc.
Silhouettes of invasive albizia trees (Falcataria moluccana) growing on a farm along the Kaumualii Highway west of Lihue, Kauai, Hawaii. Plant life is very diverse in Hawaii, and while we have many species of plants native to the islands (i.e. arrived here without human help), many commonly seen plants were introduced here intentionally by humans, as ornamentals or for other purposes. Unfortunately, introduced plants often escape from their original locations and naturalize around the islands. The term “Invasive Species” refers to plant specimens that reproduce quickly and out-place native species. Invasive species threaten our environment, economy, agriculture, human health, and/or quality of life. “High-risk” invasive plants are species that are actively being controlled by various government agencies. 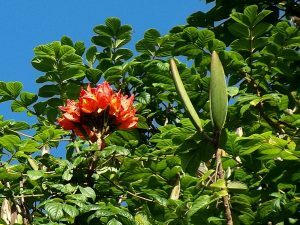 Three of this list are considered “Black List” species by the Kauai Invasive Species Committee (KISC), which means plants that are currently agency-controlled in the forest. The other two are “Phase Out” species, which KISC is working to control through their Pono Endorsement Program. 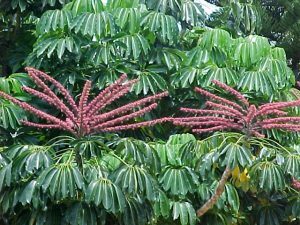 This tree was brought in as a colorful ornamental years back, and is now wide-spread in lower-elevation forests in Hawaii. It’s bright red flowers seem pretty at first, but they quickly transform into a large brown canoe-shaped pod that releases lots of small paper-coated seeds. The wind can spread these seeds for hundreds of feet and even miles. Quick to germinate and fast growing, just months after a seed lands in your flower bed, you could find a 5′ tall tree! Pull these guys out when they are just a few inches tall and you will save yourself a lot of work down the road. Schefflera trees are often sold as indoor house plants . 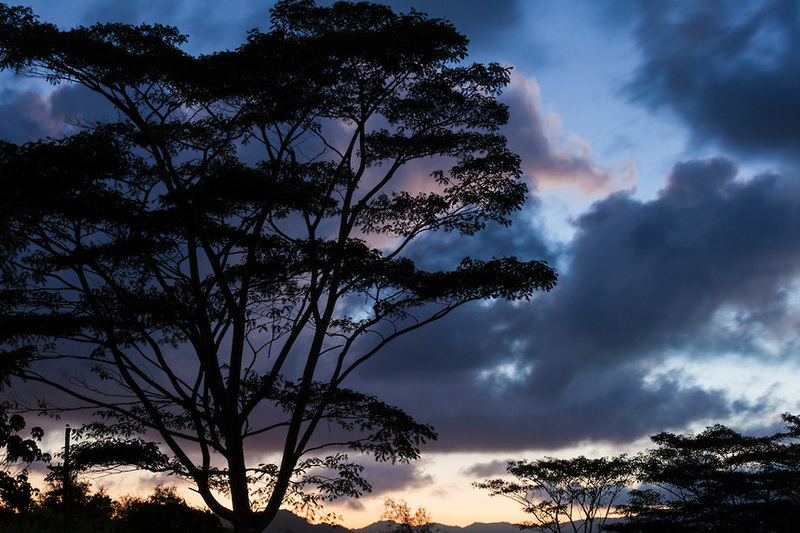 However in Hawaii, it has thrived outdoors after it’s introduction as an ornamental tree prior in the late 1800s. This tree is sometimes epiphytic (air-plant like) and will sprout from nooks in another trees, rock walls, and even in your gutter. It is fast growing to 30-40 feet tall, will strangle out it’s host tree, and is difficult to remove once it’s gotten a foot-hold in. Keep your eyes out for it’s unique radially compound leaflets, that identify this tree even in its juvenile stage. 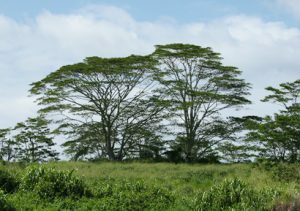 Autograph trees were widely planted as ornamental trees since the early 1900’s in Hawaii, often in commercial areas due to its low maintenance and hardiness. However, it has now naturalized in lower-elevation disturbed areas of all the major islands. Birds are able to spread it’s seeds and they germinate easily. It can grow to 65 feet tall! Look for 6” wide waxy leaves and 3” wide round seed-pods. 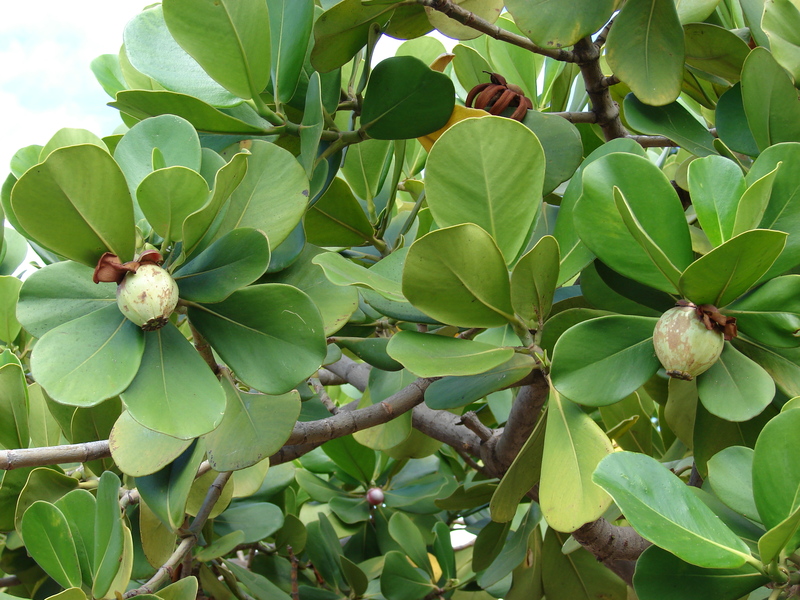 Strawberry Guava is one of the worst invasive plants in rain forest areas, such as Koke’e on Kauai. It forms dense stands of 20 feet tall trees, that suppress out native plant species. 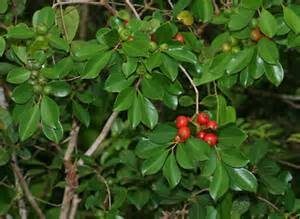 Can be identified by it’s small oval-shaped shiny leaves and bright red round fruit. Good news is you can help stop these invasive trees in your neighborhood by identifying these weed trees and removing them. If caught when small, simply pull out by hand or dig out with a shovel. Make sure to get all the roots! Simply cutting them (even all the way to the ground) will not kill these trees. The stump will re-sprout, and sprouts can even occur from lateral surface roots cut off from stump. Larger trees may require machinery to remove completely. KISC can assist home-owners in removal of Black Listed plants, so see their website for more details. Once removed, replant the area with native or non-invasive plants. Bare or open areas will be quickly colonized by aggressive invasive plants. At Seascapes Nursery, we are Pono Endorsed and do not grow or sell invasive plant species. Stop on by nursery and one of our sales staff will be happy to show you non-invasive options for your yard!